OKAY, if there's one thing that gets me bloggin', it's WORKPLACE HALLOWEEN EVENTS. And I'm talking about LAST year's Halloween, because I haven't reported on it yet, and it's already October 26. I simply can't keep two Halloweens in my memory. So I went ahead and bought all of the Tootsie Pops and made a Pops Pile. 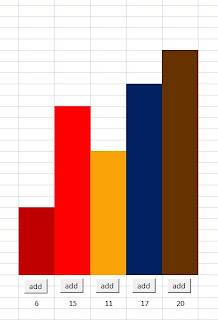 And again, I set out a sample of equal numbers of each flavor out where kids could reach them, and I encouraged the costumed children of my coworkers to take one of the color of their choice when they came a-trickin' and a-treatin'. I recorded each preference and replaced the appropriate lolly. 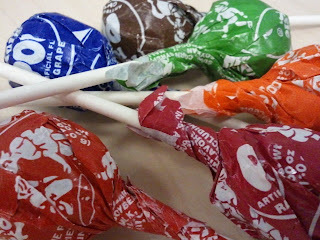 Go ahead and look up my last Tootsie Pop-ularity post, which, embarrassingly, is only a few posts ago. The winner of Halloween 2010 was the new blue raspberry flavor, which was predictably absent in 2011. In its place was a green apple flavor, which, as you can see, was the runaway winner. So I'm not going to go too deep into how I made an awesome spreadsheet that allowed me to quickly and effortlessly track the progress of each Tootsie Pop. I'm just going to say that it was awesome. As is self-evident, the greens ran out first, so I started a new graph for the remaining colors, post-green. 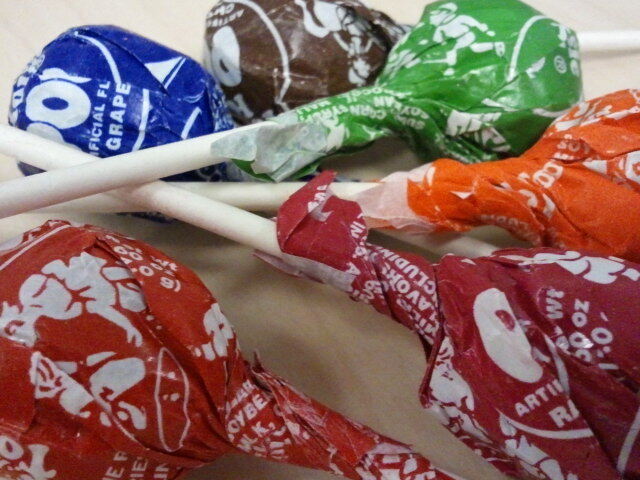 It's interesting to me that the grape and chocolate flavors did so well. The grape flavored ones (whose wrappers are plainly blue) didn't do well at all in 2010, although that was an awfully small sample size. 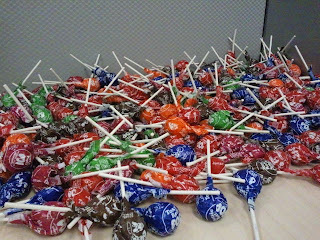 Also of interest is how badly the raspberry/dark red Tootsie Pops did once there wasn't any green on the table. So if you are trying to sell a dark-red product, try placing it near a green product and watch your sales numbers rise. I notice the orange bar doesn't look very orange. I wanted a pretty good contrast among the two reds and the orange. And it sure looked orange when I picked it. Hmm. Stay tuned for this year's results, which will be in soon. How will brown do? HOW WILL BROWN DO? ?